The tail feathers of these regal peacocks sparkle with deep green and light blue crystals. 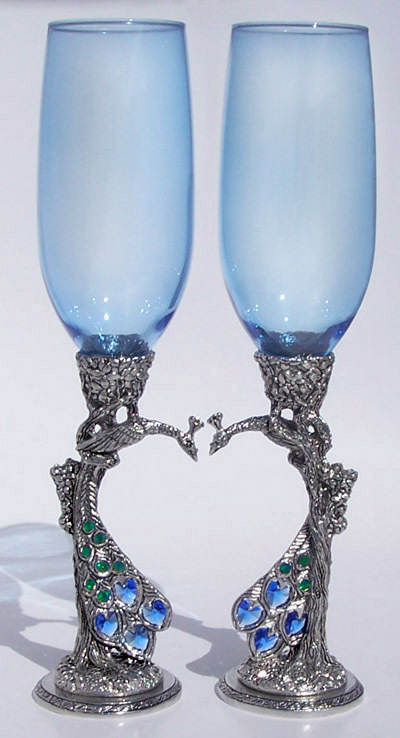 We make them by hand from lead-free pewter, Austrian crystals, and fine glass. Each glass holds 8 ounces. **For our life-long GLASS REPAIR GUARANTEE go to "Cleaning & Glass Repair" near the top of our home-page. * To see GLASS COLORS click on the "Color Chart" at the bottom of this page.